The demand for quality texts has been a cornerstone of the Escalante Math Program. In the seventies I realized that my students would be held back forever unless they had superior textbooks, so I searched for the best and tested many different texts. When I found what I needed, I demanded these texts for my students. This is part of a series offering my views on some problems with UK maths education. The first part looked at the state of affairs with regards to GCSE and PISA results, the second part looked at my attempt at a diagnosis, the third part looked at pre-existing maths education success stories. This post looks at the first common theme in those success stories: textbooks. In 1982, two years before Singapore’s 16th-place ranking in TIMMS. the Ministry of Education published and rolled-out a new, intensely researched & resourced maths program.What did it involve? Research-driven textbooks, a prescriptive national curriculum, and mandated methods of instruction across primary schools in Singapore. 13 years later, Singapore jumps 15 places in the TIMMS rankings. The curriculum and the textbooks continue to be revamped, and Singapore’s scores keep on improving. The dominance of ‘Singapore Maths’ should be well known to all UK teachers: in this last year, it has reared its head on our shores and even onto national news. So, there is a massive change in educational outcomes following a different curriculum and high-quality prescribed textbooks. 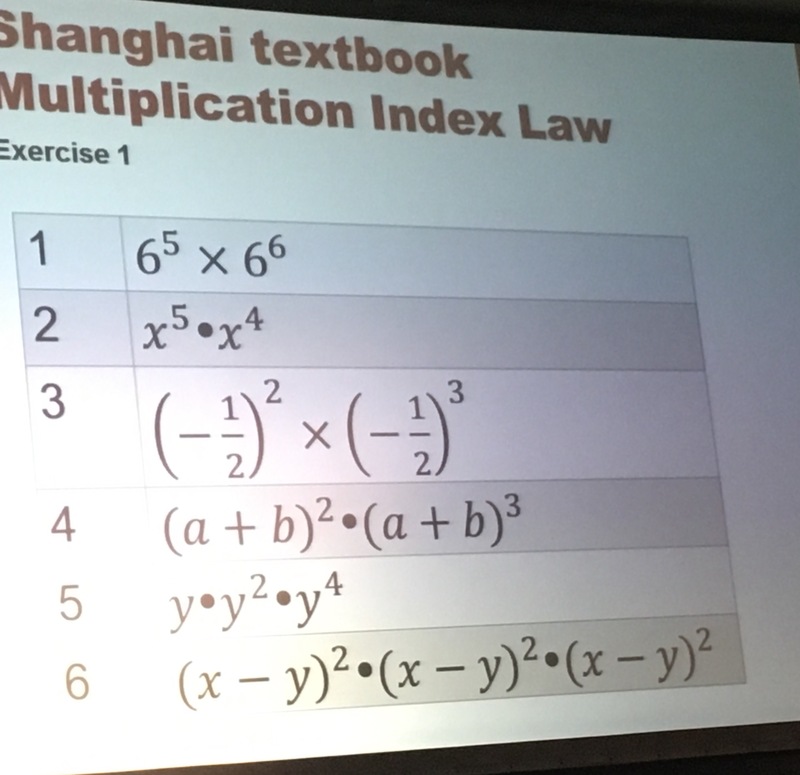 Shanghai mathematics teaching is based upon high-quality teacher resources. All schools follow the same textbook, which is published by the Shanghai education commission and refined and revised on an annual basis. Compare this with English schools, where, according to the TIMMS international survey, only 10% of mathematics teachers used textbooks as a basis for their teaching. Interestingly, their textbooks are what you might call crowd-sourced; as Tim Oates writes in his brilliant paper on textbooks, they ‘are based on accumulated theory in maths education, are written and edited by expert authors, and constantly are supplemented by ‘adjustments’ from teacher-research groups. These teacher-research groups exist across the school system. Competitions are held, whereby ‘top’ adjustments are routinely fed through into the texts.’ What a great idea, and one for us to think about as well. It’s a very similar story with Jaime Escalante, as his own words quoted above show; he spent a huge time comparing textbooks (which he describes as the ‘cornerstone‘ of his program), demanding the money for them. Moreover, where he felt they weren’t good enough, he supplemented them and even started making his own. From these successes, I believe textbooks are the best answer to the crippling problem of when students ‘don’t get it’, the second signature problem I identified in my last post. As I see it, this problem has two interlinked causes: students have problems understanding because of missing mathematical foundations, and students have problems understanding because we little coherent nor specific ideas of the best methods for teaching each topic in maths. And the root of these causes is the fact that we maths teachers in the UK don’t have the best maths pedagogy at our fingertips, in a a readily accessible and classroom friendly way. So, how can mere textbooks make such a crucial difference? In a sentence, I believe high quality textbooks, used as designed, would bring maximum pedagogical improvements to teachers in the minimum amount of time. It’s first worth noting that in the UK it’s acknowledged that our textbook quality isn’t what it could be, so I’m thinking of an idealized textbook here. But consider what it could do. We all know that it takes a lot to teach maths effectively. On a lesson by lesson basis, it involves choosing the best teaching examples, choosing and explaining the best methods and processes, creating the right tasks so students can intelligently practise what they’re learning. On a longer time frame, we then need to sequence the topics in the right order and with the right time allocation, so that new learning builds upon and itself reinforces prior learning. All of the above is exactly what textbooks (even mediocre ones) try to do. They give examples, methods, tasks, topic sequencing. But given how quickly they get churned out by publishers, their quality doesn’t compare with those from Singapore and Shanghai. Bodil Isaksen compared a relatively decent UK textbook with a Singaporean one: to the thorny topic of negative numbers, Singaporeans devoted over 20 pages, featuring multiple explanations (that I’d never seen or learnt above ever) to aid understanding, heaps bundles of carefully incremental practise questions. And the British textbook? A measly double page spread, on the very same topic. (Is it any wonder that I’ve never taken on a class (including sixth form) where every student is happy with their negative numbers?) I’d dearly love to spend 30 minutes (and then a week of lessons) going through those 24 pages, if I only had a copy. Contrast that – our current situation – with if we had a brilliantly designed textbook which implemented the above. This is what lesson planning would look like. Look at the research-driven examples, look at the research-driven methods used. If the method’s new, chat to a colleague about it. Run through it, think of the key questions and bits to emphasise. Change the examples slightly for your AfL questions. Then check which questions would be most suitable for the class I’m teaching. And then? A high quality lesson, planned. (This seems to be how they spend their time in Shanghai and Singapore, alongside marking). And if it became clear your students had a problem with a foundational bit of maths, that you thought they had covered before? Well, just grab the relevant textbook and go through that again with them. Simple! To repeat: I believe high quality textbooks, used as designed, would bring maximum pedagogical improvements to teachers in the minimum amount of time. Furthermore, we have genuine problems in the UK with workload issues, on top of our students’ attainment problems. Put together, these two facts seem a recipe for disaster (‘students are doing poorly, so teachers need to work harder!’), but high quality textbooks are the only way to reduce workload and improve pedagogy at the same time. In deciding the best strategy, it’s always worth asking: what are the alternatives for improving our pedagogy in this country? CPD sessions are limited to those who have many people have gone. It is often common for someone who goes on CPD to share their findings with their department, but in my experience, this rarely changes other’s practice. Specific-focus CPD sessions take up a lot of time for what they give in return: usually, you’re lucky if there’s something much better than a 1:1 ratio between ‘time spent doing CPD’ and ‘lesson time which involved using what I learnt’. Obviously, this ratio is useless for promoting widespread pedagogical changes. More general CPD sessions are too general in that they usually don’t provide any worksheets or tasks to go along with new explanations. For example I’ve been to several where I’ve learnt an exciting new way of teaching something – for example, using Cuisenaire rods to explain fractions – yet when I tried to do it in the classroom, it became apparent I had no idea how to design a task that lets students practise and embed their new understanding. I’ve been to other CPD sessions where I’ve learnt principles like ‘concrete-pictorial-abstract‘ – but it then gets really hard or time consuming to know how exactly to implement that principle in actually teaching most topics. I’m focusing a lot on the downsides of CPD, since this is a big feature of current efforts to improve our pedagogy. CPD is very useful – have a look at this must-read intro to bar modelling, a key feature of Singapore maths – but without accompanying textbooks, resources and problem sets, it gets a lot harder to implement such methods in the classroom (and within a school) on a consistent, widespread and sustained basis. Again limited to the individual who does it. Luck plays the biggest part – who was online at the time, which staff member you asked, whether you searched ‘reverse percentages’ or ‘finding the original amount’. Near-impossible to know, of all the suggestions, which one is actually the best. It’s hard to do for every single lesson and topic you have to teach. Reading more books on teaching maths, research papers, etc. Similar to CPD, these books and papers are helpful but rarely include the tasks for students to practice. So, you’ll have to spend time making them yourself. Many useful papers are written for academic audiences, and difficult for teachers to digest quickly. The sheer volume of research out there, often with contradictory findings. You don’t know what you don’t know: whether there are better methods, or where exactly you are going wrong. Takes a lot of time for each lesson. Even when we reflect and find/learn something useful, we’ve taught that lesson already, and it might be months – even a whole year! – till you teach it again. Given the widespread shortage of maths teachers and widespread budget cuts, this seems an impossibility. This seems the best sustainable short- to medium-term alternative to a textbook, because in effect it involves a department making their own textbook – that is, deciding upon their own methods, examples and question sets. It’s a good alternative because the division of labour makes it somewhat more sustainable, achievable (even in the next year), and a good improvement upon many departments that leave every teacher to plan the same topic/lessons for themselves. However, it only pools the wisdom of your maths department, and again without professional research-driven expertise, it’s hard to decide on the best methods when several staff members compete. Similarly, its benefits are then limited to that one maths department. It takes a lot of planning, commitment and time from the entire maths department – either it is done wholesale, or it will usually peter out before too long. Those are the alternatives I can see. The last one is the best practical alternative in the absence of such high quality textbooks; but even then it seems like an interim measure to me. So, from comparing all these possibilities, my conclusion is clear: when maths teachers get CPD/advice/papers/reflection/time/websites/conversations, we teach a topic better (hopefully). But when maths teachers get a brilliant textbook, we’ll teach everything better. Practically, it’s naturally discouraging that we don’t seem to have anything of that quality in the UK. But we’re in exciting times. This post is a little late, really. Nick Gibb MP keeps banging this drum. Maths Mastery were initially a little reluctant but are now piloting a workbook. The team at Michaela are creating them and asking for help to improve it. But as Nick Gibb says, ‘to win the battle for textbooks, it is vital that we publicise the great gains textbooks provide in reducing the burden on hardworking teachers’. If there’s more demand for it from ourselves, it’ll come. And of course, even a high-quality textbook is useless if it’s stuck in a cupboard by a sceptical do-it-yourself teacher; we also need to promote a widespread acceptance & understanding of the power of textbooks. @larrylemonmaths @HinTai_Ting A pointless book. Maths teaching has a lot of teachers who would go out of way to teach in a different manner. Similarly, Kris Boulton and Naveen Rizvi made similar points about in excellent posts on TES, and met with strong opposition. A one-size-fits-all approach is unlikely to improve children’s learning. Worse still, it undermines more important features of our culture and heritage, where we punch above our weight in creativity and celebrate originality and difference rather than uniformity…. We know “excellent teaching” is a complicated cocktail of good mathematical models, inspiring children to investigate and solve problems and a fundamental base of practice and memorisation. But most of all it requires dedicated professional and stimulating teachers. The sentiments sound good, but I believe ultimately far too optimistic. As I’ve argued above, the latter point on ‘excellent teaching’ creates a false dichotomy: quality textbooks are the best way to serve and improve ‘dedicated professional and stimulating teachers’, as opposed to an alternative to them. The former point on creativity and originality – again, that, to me, is a luxury that most dedicated teachers simply don’t have enough time for. As I argued above, there aren’t many feasible alternatives. All this scepticism is a big motivation for my banging the textbook drum again. The two best maths jurisdictions in the world base their entire maths education systems on prescribed high-quality textbooks. The most inspirational maths teacher in America fought vigorously for them. We’d be wise to follow their lead. Practically speaking, how might this insight be applied for September 2016? I can think of a few ideas. Firstly, if you have the resources, you might benefit greatly from purchase Singaporean textbooks (since they’re in English) for the use of your incoming KS3 bottom sets. If that’s too expensive, perhaps buy a copy for your own department’s reading, CPD, and planning – they are readily available online. Then, if you don’t already, get together with your department, allocate reading/planning explanations and tasks using the textbooks, so you can get ahead and create your very own Singapore Maths curriculum and scheme of work together. If that sounds too extensive, have a look at topics where you see your students (especially the weakest) struggle the most, and use the textbooks there. I can’t think of a faster way to improve pedagogy across a department (or even the country) than that. A very interesting post highlighting a key aspect within maths. I am trialling a Singapore maths text book this year, with all my classes and using as part of my SCITT training programme , which appears to tackle most issues, building depth which is the key aspect but also caters for varying levels and has differentiated worksheets, saving valuable time for me. Let’s see how my classes fare? If anything it would seem teachers need a book to help them teach better rather than students needing a book to help them learn better. From experience, a good textbook can lead to very poor teaching because the teacher feels the job has been done from them. Of course that’s a valid problem. But it doesn’t follow that a good textbook will make all teachers lazy and poor teachers. That’s not what happens in either Shanghai nor Singapore. Instead, to me it suggests some deeper problems with such teachers… if they’re lazy enough that textbooks make them stop trying, to be honest I’m sceptical about the rest of their efforts even without textbooks. Surely access to TES and other resource heavy websites carries the same risk? At least with a good, research informed textbook, we can be assured of the quality of the resource being used, unlike downloaded materials. If people are going to cut corners, they’ll find a way. A decent textbook would mean their students will be less likely to suffer for it.